On Pentecost Sunday my friend’s baby boy was being baptized. I couldn’t figure out what to make him, and then I found these adorable dolls on Etsy . Saint Joseph was Jesus’s foster father and is the patron saint for workers. 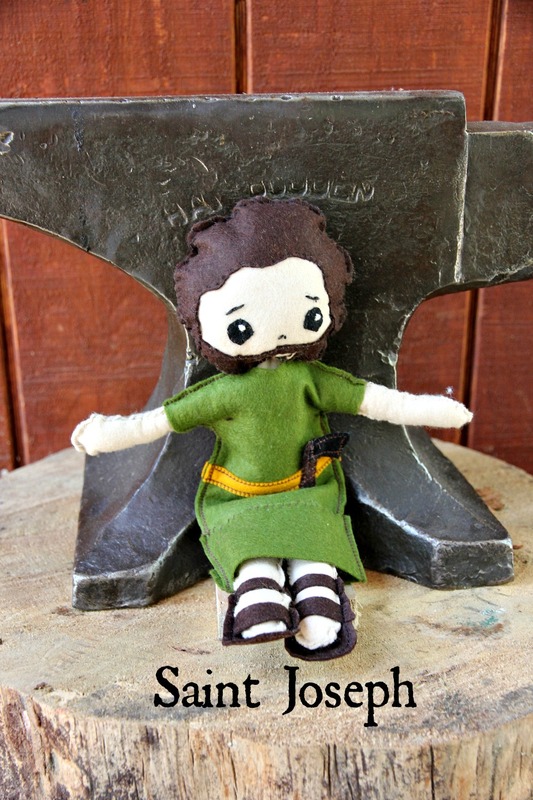 He was also a carpenter, hence the axe. 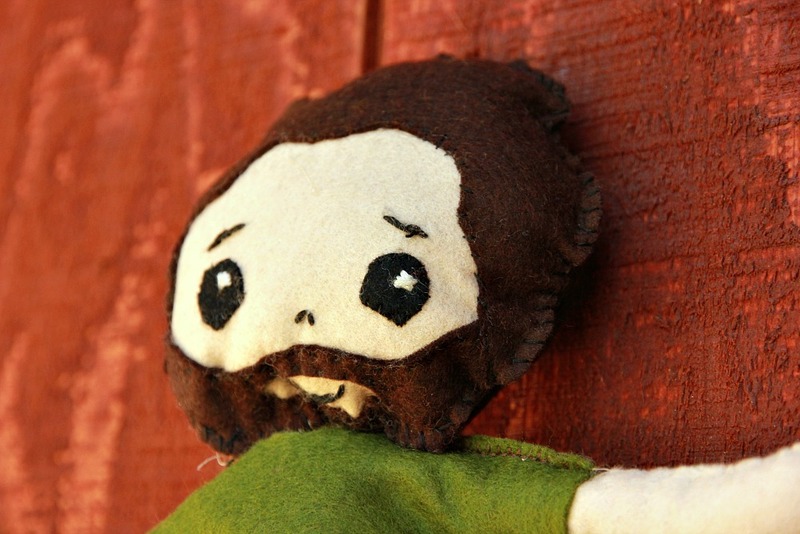 I sewed most of the doll by hand, which took a long time, then I figured out I could use the blanket stitch on my sewing machine, which was a lot quicker and still gives a hand sewn look. Good thing, because my hand stitches are really awful! I’d like to say I added my own spin on the design, but no, I pretty much copied the thing down to the little axe on the side. So I won’t be sharing a tutorial , since I copied it. Even if I did figure out how to make it on my own. But it does make me want to open up a discussion about copying from others and how you as readers and creators yourselves feel about it. 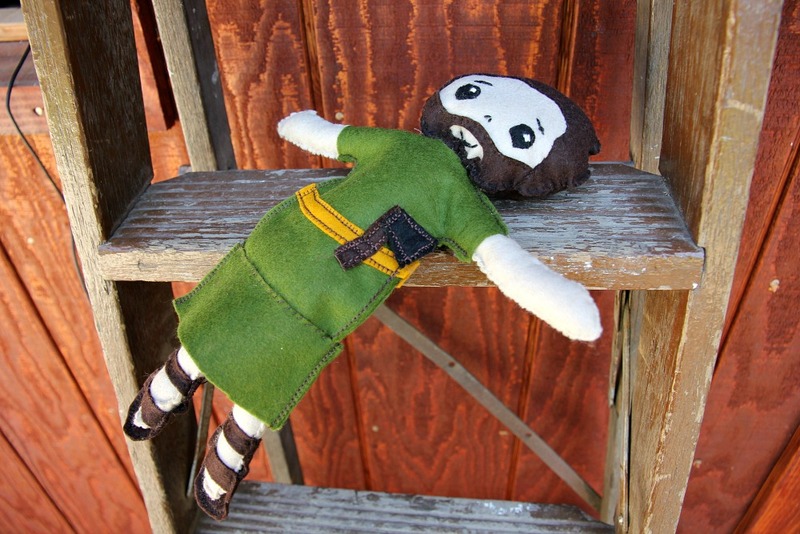 I recently brought up a thread in one of my sewing blogger Facebook groups asking how they felt about the idea of doing knock offs of certain popular indie patterns out there. In my line of thinking, I was wondering why I should spend maybe twelve or fifteen dollars on a pattern I would have to download and print out (ugh) , when I could just hack and existing pattern to get the same look. There were a few pattern designers in the group and they felt they would be annoyed if this happened to them. So why is it not OK to copy from say, an Etsy seller or an indie pattern designer, yet you see DIY hacks from things sold at Anthropologie, J Crew, and there is (or was ) even an official IKEA hack site ? Is it OK to take ideas from the big corporations but not the little guy? Or is it OK to take ideas from everyone? Or not OK? As creative people, we are always influenced by others, either directly, or subconsciously without even realizing it. I mean, they all put their ideas out there on the internet to settle into our subconscious brains, right? Would I be shunned if I saw an Indie pattern design I liked and just decided to make my own knock off version of the design, because I know how to and because I also hate dealing with PDF patterns? Here is my philosophy on copying. There is nothing wrong with copying if it’s for my own personal use or a gift, but the minute I try to financially gain off lifting someone else’s design, that’s wrong. 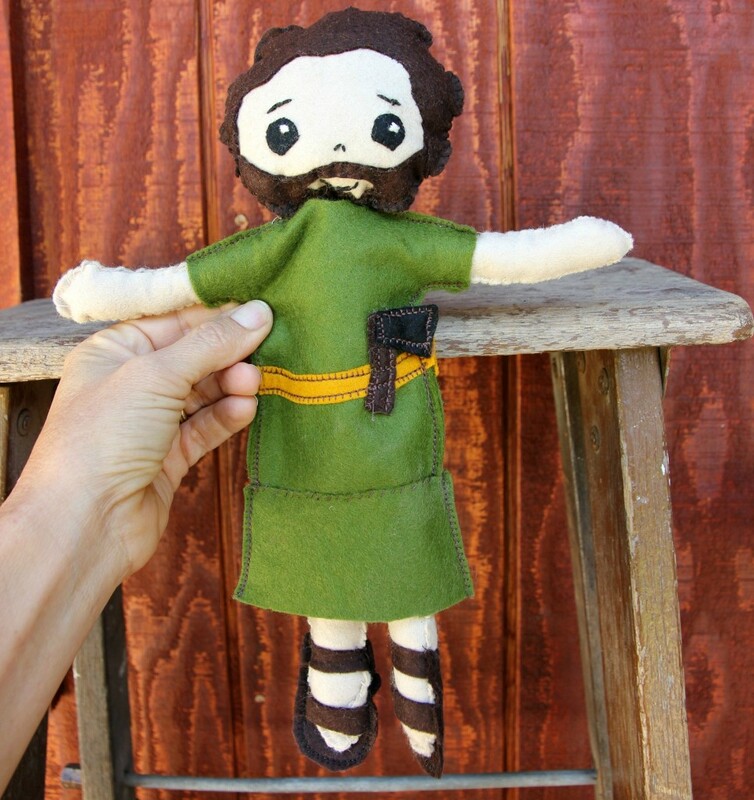 If I set up an Etsy shop trying to sell these St. Joseph dolls, that would be pretty tacky. But if I came up with an idea and then later found out there was something similar on the market, I would go ahead and proceed with my idea. There will always be similar things in the marketplace, and I would know I didn’t directly take someone else’s idea. What about tutorials? Popular tutorials increase page views and bring in ad dollar revenue. Is it ethically wrong to show how to draft a pattern that is seriously similar to something else that is already out there? There’s no doubt that a lot of pattern designs out there are very basic and not that unique. It seems many of the designs are similar to things one learns in first year pattern design courses. There are so many pattern designers out there now, that it would almost be impossible not to be accused of copying, even if you weren’t. Big businesses copy all the time. Look at Forever 21 and H&M. It isn’t even illegal to copy clothing designs here in the US. How do you personally feel about copying? love the doll, I’ve never seen one. I’m right with you in everything you said. I think those of us who have worked in the fashion design industry have a better grasp on how design is influenced. I love sewing bloggers and pattern designers and I do not mean to come off snobby but it’s a very fast world and nothing anybody is coming up with is new. From clothing to music and onward. If you possess the skills to knock it off then that’s what you should do. Great post! Totally agree with everything you said. I would draw the line at profiting, as you also said. Indie patterns are really expensive. I have to seriously want it and not be able to find something remotely similar in order to spend that chunk of change on it. I did with my Angel Boot cut jeans and they are fabulous and I won’t ever regret spending the money for that one! Now, I have noticed with some indie patterns how they are so similar to the Big 4 patterns. So if I see an Indie pattern I like, I do my research first. I’m experienced enough to make changes to a pattern to get what I want. Sometimes I go to the mall and just look at the inside of clothing to figure out how it was made. Afterall, isn’t that our goal as a seamstress? Not everyone desires that though. I always look at the insides of clothes too. I was tempted to buy some cheap shorts from Wal Mart. The fit was great and they were only seven dollars. I can cut cut them apart, use them for a pattern and figure out the contraction at the same time. Cheaper than most patterns, actually! It’s on my to do list. I have done that too! Buy once and cut twice ha ha. Sometimes you don’t have to cut it apart. Just fold it at the seams and pin if you have to in order to get it as flat as possible. Great post, Justine! Quite a while ago, I started the draft for a post on whether it was OK to sew Knock Offs. Ha, ha.. wrote the whole thing in my head, but didn’t ever finish typing it up. Maybe one day. I agree with your thoughts, especially on the differing opinions re copying big companies versus Indie designers. Copying is copying – bottom line. I figure it’s OK as long as you’re not making money via the copy. Sewists have been copying since sewing began. My mother used to take me to the shop, tape measure in hand, when it came time for new school uniforms. In front of everyone, she would take measurements of the store bought uniforms and compare to my measurements. Then she’d go home and re-create (copy) the store bought uniform. At the time I was mortified. Now I think… good on you Mum!!! And as far as anything being truly new… It’s all just fabric sewn together. There’s only so many ways it can be done. I often see new kids’ designs that I was wearing in the 50s and 60s. Everyone copies, even the indies. I buy a pattern if I can not make it myself or by combining patterns. Indies can not claim total rights to creativity and it infuriates me when pattern designers act like it. What you say is true. I agree with not profiting from someone else’s idea. I copied a bib I saw on etsy. I used my own bib shape, decorated it like the one I saw, and changed it up a little. I have given that bib to lots of people. I would feel comfortable posting a tutorial to allow others to make their own… But I would post a link to the etsy store in case they would rather buy the finished product. I think recipes have the same problem. A muffin is a muffin, but by making a slight change (add raisins or change white flour to wheat flour) it becomes a custom recipe. I just read from a food blogger that with recipes it’s Ok for food bloggers to repost the recipes of others. It’s hard to believe that’s OK, though. Fashion can’t be copyrighted. There are only so many ways to make a dress, the devil is in the details. How wide is the collar?How deep the neckline? The biggest difference between an expensive item and a knock off probably will be in the details. The designer dress will probably have better fabric, even exclusive fabric, more time consuming details etc. If I make it myself, I am in control of all that. Let’s say I want to make a swing top. Because I live in Merida, I can’t go to the store and buy a pattern (even though it’s a major city of over a million people, not some little pueblo), none of the fabric stores sell them. I can buy a magazine like Burda Style however or down load a pattern, but I am more than likely to just make my own pattern. Mostly because no matter who makes the pattern, I will have to alter it. My swing top obviously be a swing top, but maybe it won’t be as full as the INDY pattern, or it may have a different pocket or be finished differently. Now, if I take someone else’s tutorial, turn it into an e-book and sell it online, then I am stealing. Or buy someone else’s pattern, copy it verbatim and sell it, it’s stealing their work. It takes a lot of work to develope a pattern in a size range. You can’t copyright recipes either unless you come up with a totally new process. If I post a recipe that I made from a cook book, I always credit the book, and cite the author. Who knows? Someone may decide to buy it after trying the recipe, what you can’t use is the discription or the little blurb about the recipe. ” Copyright law does not protect recipes that are mere listings of ingredients. Nor does it protect other mere listings of ingredients such as those found in formulas, compounds, or prescriptions. Copyright protection may, however, extend to substantial literary expression—a description, explanation, or illustration, for example—that accompanies a recipe or formula or to a combination of recipes, as in a cookbook. Only original works of authorship are protected by copyright. “Original” means that an author produced a work by his or her own intellectual effort instead of copying it from an existing work.